Mercedes-Benz V-Class Running Costs, MPG, Economy, Reliability, Safety | What Car? Pricing is yet to be 100% confirmed for the facelifted model, but the outgoing V-Class doesn’t come cheap, and the latest version is sure to follow suit. Whether you judge it against the similarly van-like Ford Tourneo and Peugeot Traveller, or regular MPVs such as the Ford Galaxy and Seat Alhambra, the Mercedes is a much pricier option. Even the VW Caravelle, itself far from cheap, isn’t quite as costly to buy as the V-Class. As for the Marco Polo campervan, it’s list price is eye-wateringly high, more so than VW’s Caravelle-based California. For the best all-round value, go for the V 220 d. It combines strong enough performance with the best official fuel economy and CO2 emissions in the range. 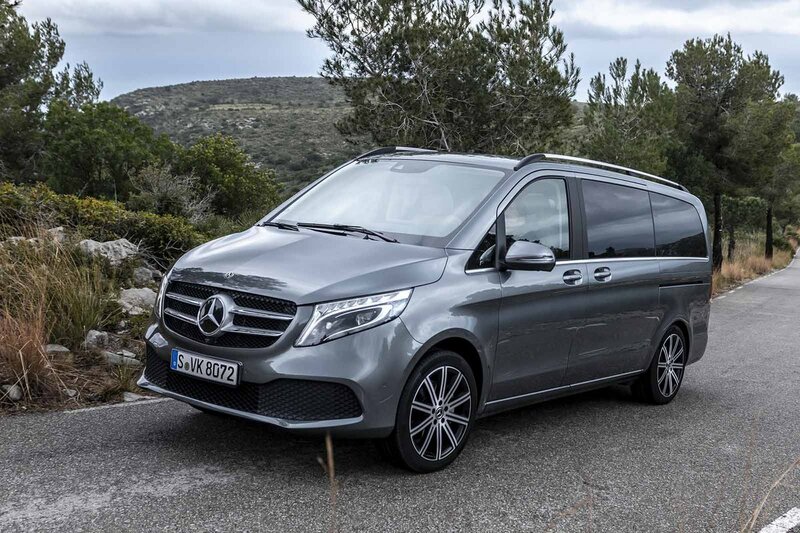 Bear in mind though, that the V-Class, as with the other van-based models, isn’t as good in these respects as regular MPVs, such as the Galaxy. As a result the V-Class will cost you considerably more in diesel, as well as in Benefit-in-Kind (BiK) tax if you’re a company car user. On the plus side, the V-Class has the best residuals in this class, closely followed by the Caravelle; although the Mercedes is more expensive to service over a typical ownership period of three years and 36,000 miles. The Sport model comes well equipped. Highlights include 18in alloy wheels, LED headlights, power-folding door mirrors, parking sensors front and rear with a reversing camera, a powered tailgate and sliding-rear doors, rear privacy glass, sat-nav, Bluetooth, cruise control and full Nappa leather upholstery with heated front seats. It’s hard to justify the AMG-Line version; all your extra outlay gets you is a set of 19in alloy wheels, sportier body styling, metallic paint and carbonfibre-look interior trim. You can also get Exclusive trim, which sits above AMG Line and adds more luxurious, armchair-style seats for the middle row. Full specification is yet to be confirmed, but it'll push the price up even further, making it even more difficult to recommend. There are two Marco Polo versions available. The Marco Polo Horizon gives you two beds but few other campervan luxuries, while the version named simply Marco Polo gets the kitchenette. Mercedes doesn’t have the most consistent reliability record, as was highlighted in the 2019 What Car? Reliability Survey. Mercedes finished near the bottom of the table, below Ford, Volkswagen and Seat. At least Mercedes provides a decent three-year, unlimited mileage manufacturer’s warranty, which should offer some reassurance. Also positive is that the V-Class offers good crash protection, scoring the full five stars in Euro NCAP safety tests in 2014 – although more stringent tests have been introduced since then. All models come with a driver fatigue monitoring and automatic emergency braking (AEB), while the optional Driver Assistance package includes adaptive cruise control, seatbelt pre-tensioning, blind spot warning and lane-keeping assistance.